​Pharmaceutical preparations for treatment of conditions such as rashes, skin irritation, stings, fungal infections, etc. are normally supplied in the form of a cream or ointment as this provides an effective means of delivering the active ingredient directly to the required area. Products can be either a water in oil (w/o) or oil in water (o/w) emulsion, consisting of waxes, emollients and lubricants dispersed in an oil phase, and a water phase containing emulsifying, stabilizing and thickening agents, preservatives and in some cases, colorant. Active ingredients are dispersed in either phase or added when the emulsion has been formed and allowed to cool. 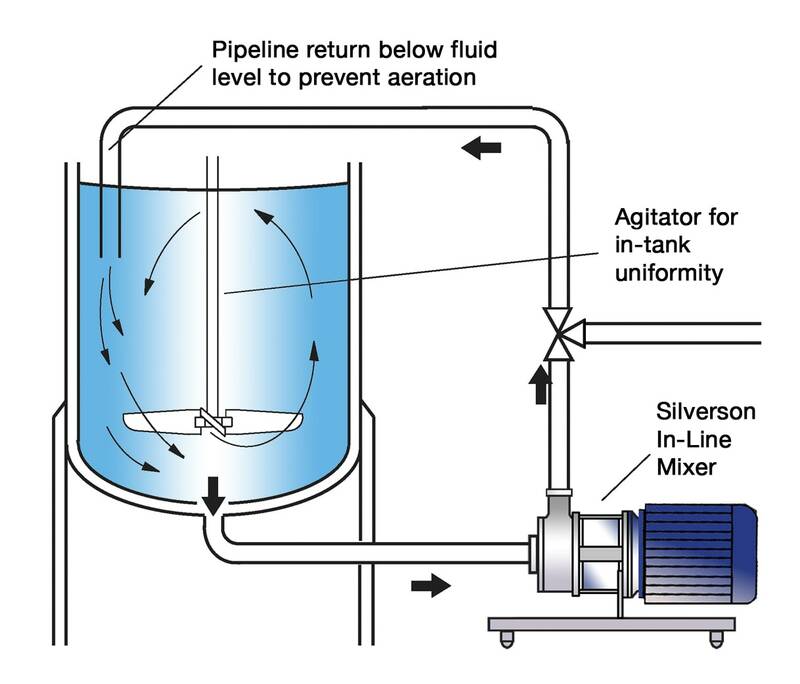 Preparation of the oil phase. Flake/powder ingredients, sometimes dry blended in advance, are dispersed into mineral oil or silicone oil. Heating may be required to melt some ingredients. Hydration of aqueous phase ingredients. Emulsifiers, thickeners and stabilizers are dispersed into water in a separate vessel. Heating may be required to accelerate hydration. Forming the Emulsion. The two phases are blended under vigorous agitation to form the emulsion. Dispersion of the Active Ingredient. The active ingredient often makes up only a small proportion of the formulation; this must be efficiently dispersed to maximize yield and product effectiveness. When added to water, thickening, stabilizing and emulsifying ingredients can form agglomerates which agitators cannot break down. Similarly, oil phase ingredients can form lumps which require shear to disperse. Ingredients must be fully hydrated to obtain the required viscosity and develop yield. 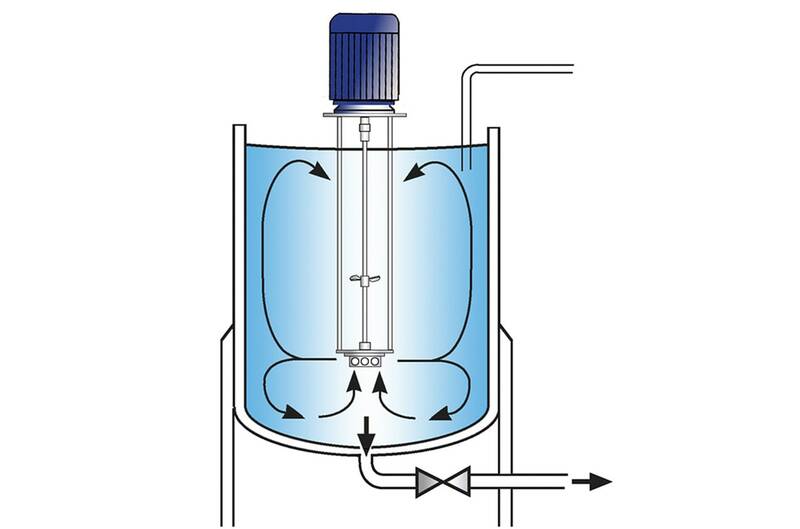 Partially hydrated materials can build up on the vessel wall, in-tank baffles and parts of the agitator. 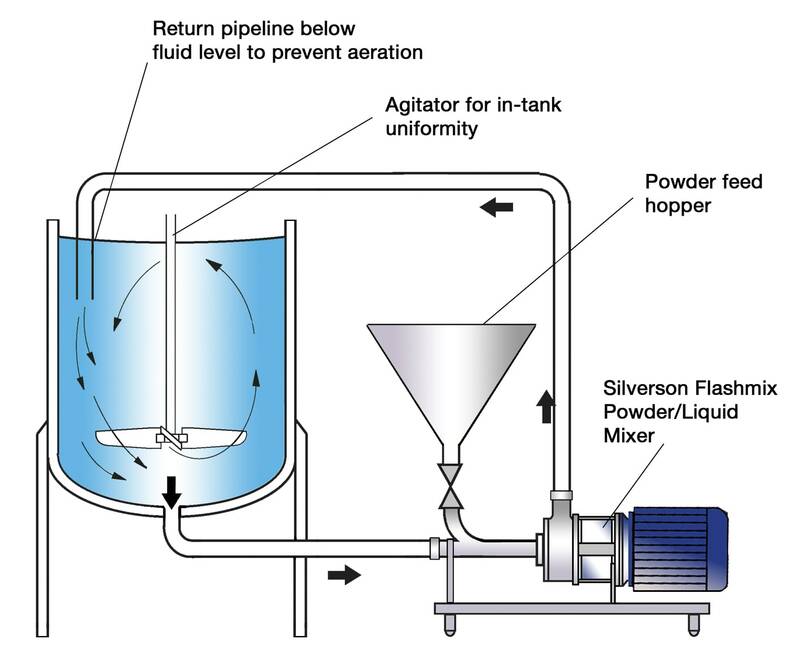 Agitators cannot sufficiently reduce droplet size to form a stable emulsion. Active ingredients can be temperature sensitive. Cooling of the product before adding the active ingredient further increases processing time. Poor dispersion of the active ingredient impairs product effectiveness. Long mixing times and additional equipment may be required to obtain a homogeneous and stable finished product. 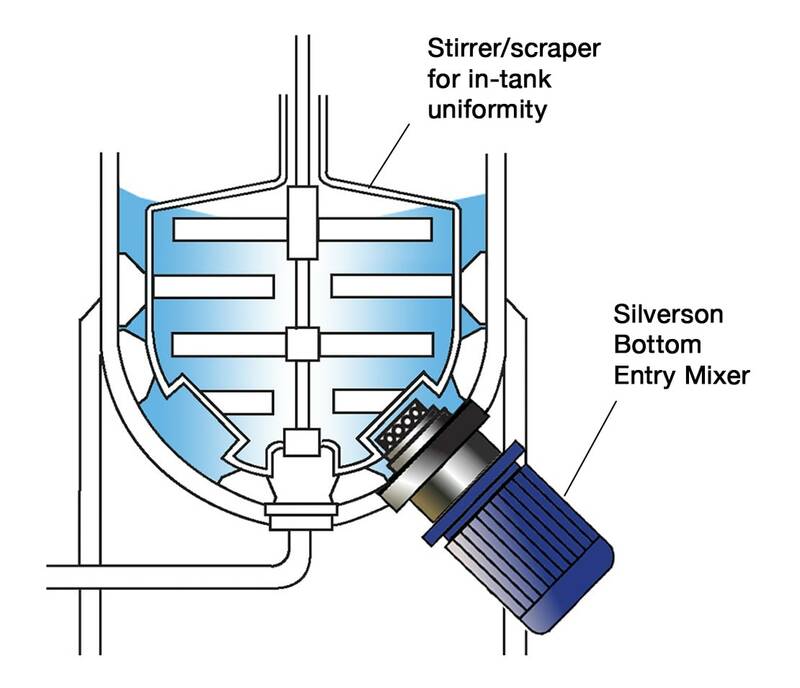 The high speed rotation of the rotor within the workhead creates a powerful suction which draws liquid and solid ingredients upwards from the base of the vessel into the workhead. Centrifugal force drives the material to the periphery of the workhead where agglomerates are broken down in the precision machined gap between the tips of the rotor blades and the inner wall of the stator. The product is then forced out through the stator and circulated into the body of the mix. At the same time fresh material is drawn into the workhead. The intake and expulsion of ingredients through the workhead sets up a circulatory pattern of mixing in the vessel. All the ingredients pass through the workhead many times in a short mixing cycle, which progressively reduces particle size, and ensures that an agglomerate-free, stable and homogeneous end product is obtained. Maximized yield of raw materials as thickening agents are fully hydrated and other ingredients fully dispersed. In-tank baffles are not required, improving vessel hygiene. Pre-mixing of powdered ingredients can be eliminated. The aqueous phase can be produced at ambient temperatures, reducing heating costs. This also accelerates cooling of the mixture, further reducing process time and costs.